While most riders are finalizing their preparation for the big events in the Belgian opening weekend and the month of March at the major stage races in Oman, Spain and Portugal, France offers an alternative path that appeals to the classics riders. The two-day Tour du Haut Var is a race made up of two hilly classics that make it the perfect preparation for the biggest one-day races and it is no wonder that some of the best riders in this specialty use the race to fine-tune their condition for their big objectives. The third week of February has built a reputation as one of the most important weeks of the early season. With no less than four stage races, it is the a crucial time for most riders to get in the important racing kilometres that set them up for a successful classics season or spring stage race campaign. While the Tour of Oman, Volta ao Algarve and Vuelta a Andalucia are traditional stage races in the sense that they are for true stage race specialists and are decided in the mountains or in time trials, one race is different. The two-day Tour du Haut Var in Southern France is not one for the riders who excel in grand tours. Instead, it is a tricky an unpredictable affair and its hilly terrain makes it perfectly suited to classics specialists. The race was once a hilly one-day race that combined forces with the Classic Haribo to form a weekend of racing in Southern France. The latter was a sprint race which disappeared from the calendar after the 2006 edition and its demise opened the door for the Haut Var organizers to make their race grow. Since 2009 it has been held as a two-day race that has offered classics riders the perfect chance to prepare for the Belgian opening weekend. The course for the race has varied a bit from year to year. While it has no major mountains, it is definitely no race for sprinters and it has rarely offered any chance for the pure sprinters. In its early years as a stage race, it had several uphill finishes on short, steep walls but in recent years it has abandoned that format. Instead, it has usually had an opening stage that has come down to an uphill sprint, and a tough stage around Draguignan that has suited aggressive classics specialists. In general, its two stages can be regarded as two consecutive classics and their open natures make it very unpredictable affair and have turned it into a tactical race that has often been decided by seconds. This is one of the stage race that the classics specialists can realistically win and while the field is dominated by French riders, many international classics stars prefer to prepare for the one-day races in an event that has similar conditions to what they will find in the biggest races. After the race abandoned its finales on steep walls, it has had a pretty identical format in the last few years. The first stage has finished on a circuit in La Croix-Valmer three years in a row after a day in moderately hilly terrain. With a slight uphill finish, it has traditionally suited the powerful sprinters, with Romain Hardy and Thor Hushovd winning the first two editions. Last year Carlos Betancur created a major surprise when he beat John Degenkolb in the sprint in this stage. The second day has traditionally offered a long, hilly course around the city of Draguignan but the flat finish has made it open for several different outcomes. In 2013, Lars Boom, Arthur Vichot, Daniel Oss, Laurens Ten Dam and Pierrick Fedrigo managed to escape on the final climb and they narrowly held off a reduced peloton, with the former winning the sprint. Last year it was Betancur and Amael Moinard who made a similar move, with the Frenchman taking the stage win and the Colombian claiming the overall win. This year the second day will again offer its traditional hilly stage around Draguignan but the first stage has been changed significantly. Its 164.6km brings the riders from Le Cannet des Maures to a new finish in Seillans and the terrain is generally pretty hilly. In the first two thirds of the stage, the riders will tackle five smaller climbs that will tire the legs before the exciting finale. The drama starts with 15.5km when the riders go up the Mur de Montauroux which is 300m long and has an incredible gradient of 21%. After a quick descent, they descend to the final 10km that consist of a long gradual uphill drag to the line. The second stage both starts and finishes in Draguignan and even though the course is a bit different, it is very similar to the one that has been used for the past two editions. The 194.7km course barely has a single meter of flat roads as it is up or down all day. In the first two thirds, the riders tackle four bigger climbs that will turn it into a long day of attrition. They end the race by doing two different circuits around the finishing city. The first is 20.2km and despite its undulating terrain, it has no major climbs. The second circuit is 18.2km and includes the difficult Cote de Tuilieres which has sections of 15% and comes just 15.1km from the finish. It is followed by a descent, a short climb and another descent before the riders hit the final flat section to the finish. The finale is identical to the one that ended last year’s race. The Tour du Haut Var is one of the most unpredictable stage races on the calendar. With no major summit finishes or time trials, it is a race for classics specialists and it has the same chaotic nature. While a mountaintop finish is often decided by the strongest legs, the Tour du Haut Var is determined by a combination of tactics, luck and legs. This year the race has been given an extra element of uncertainty as the new first stage seems to be very unpredictable. The organizers have not provided an awful lot of information about the final rise to the finish and it is not clear whether the strong sprinters will be able to shine in this kind of finish or whether it is one for the puncheurs. Furthermore, the second stage has no obvious favourite. In the past, it has been won by strong breakaways who have managed to stay away but the bunch has followed close behind them. This stage can both be won by a small group or a sprint from a reduced peloton. There are no bonus seconds in the Tour du Haut Var and this means that the race is decided by actual time. As both stages could be decided by sprints, it will probably come down to a countback, meaning that it will be decided by the lowest total of stage placings in the two stages among the riders who are in the same time. This means that the race suits fast riders who can both do a good uphill sprint in stage one and mix it up in a sprint from a small group or go with the final attacks in stage 2. The field is loaded with good classics riders but one rider stands above the rest. For the first time in a few years, Philippe Gilbert will ride the Belgian opening weekend and he has made it clear that he prefers to do a bit of racing in Europe instead of coming straight from the Middle Eastern sun. Hence, he has decided to skip the Tour of Oman and will be at the start of the Tour du Haut Var for the first time since 2012. Gilbert looked very strong in the Dubai Tour where he had to brake a few times in the tough uphill sprint on stage 3 but he came very fast when he got up to speed. He was also riding well in Qatar where only a mechanical prevented him from joining the front group on the dramatic second stage. In general, he seems to be riding better at this time of the year than he has done for a couple of seasons. That is in line with his strong showing at the end of 2014 where he showed signs of a return to his former level. He is building condition for the Belgian opening weekend and will use this race and the Tour du Haut Var to fine-tune his condition. Gilbert never does any race purely for training and this means that he will go all out for the win in France. On paper, the race suits him really well. Depending on the toughness of the final slope in stage 1, he will be the favourite to win the opening stage. He is very hard to drop in this kind of terrain and should be able to follow the late attacks. Finally, he will also be able to mix it up in a sprint from a reduced group and this means that he should be among the best in both stages. With a win in stage 1 and solid results in stage 2, there is a big chance that he will win the race overall and he can count on a strong BMC team to control what is often a very uncontrollable race. This makes Gilbert our favourite to win the race. His biggest rival could come from the Ag2r team which is without defending champion Carlos Betancur. Samuel Dumoulin is perfectly suited to this race as he is very strong in this kind of terrain, has a fast sprint and is very punchy in this kind of uphill finish. He had an unusual season start in Australia where he proved that he was riding really well and in general he has always been among the strongest in the month of February. On paper, Dumoulin may have a hard time following the likes of Gilbert in stage 2 but he shouldn’t be too far off the mark. Furthermore, he is probably slightly faster than the Belgian in a flat sprint and this provides him with options if it comes down to a sprint from a reduced peloton. As he should also be among the best in stage 1, this rac suits him really well. With solid showings in the GP La Marseillaise and Etoile de Besseges, Jonathan Hivert seems to be back on track after a disappointing year with Belkin. He may still not be at his 2013 level but he is getting close. Back then, he was virtually unbeatable in uphill sprints and this will make him a clear contender in stage 1. As he is also a very good climber, he should both be able to join late attacks and sprint from a reduced bunch in stage 2 and this makes him an obvious candidate. However, Hivert is not the only card in the Ag2r camp. Armindo Fonseca excels in uphill sprints and he will relish the chance to go for the win in stage 1. Furthermore, he is a decent climber and he should have no trouble surviving the strains on stage 2. He may not be able to join the late attacks but if it comes down to a bunch sprint, he will be among the fastest. This will make him an overall candidate too. FDJ is without Arthur Vichot who is usually very good in this race and instead they have a team with no clear captain. One of their best cards is new signing Kevin Reza who is suited to this race. At 100%, Reza is a solid climber and he is very fast in a sprint from a reduced bunch. In fact, his main reason for signing with FDJ was the fact that he will get more personal chances in races of this kind. He has not shown his best condition in the first few races but if it comes down to a sprint in stage 2, he will definitely be one of the contenders. Oscar Gatto finds himself in a very similar position. As he proved in last year’s Tour of Austria, he is very strong in an uphill sprint and if the final climb in stage 1 is not too steep, he will be among the favourites. He is not the fastest rider in a flat sprint but he has been able to win bunch sprints in the past. If the second stage turns out to be less hard, he will definitely have a chance. Fabian Wegmann has had a hard time in his final years with Garmin but after he has signed with Cult, he has been flying. He was among the strongest in the GP Costa degli Etruschi and at the moment he seems to be one of the best in this kind of terrain. He is very strong in an uphill sprint and will be a contender in stage 1. He may have a hard time in a flat sprint on stage 2 but if a small group escapes, he should definitely be there. The race has a few fast riders who will try to hang on for dear life in stage 2 and cross their fingers that all attacks will be brought back. Luka Mezgec, Alexei Tsatevich, Baptiste Planckaert and Davide Appollonio are all good in an uphill sprint if it is not too steep and they will also be able to survive a decent amount of climbing. If it comes back together for a sprint in stage 2, they will be among the favourites and if they haven’t lost any time in stage 1, that may be enough to win the race overall. On paper, this race suits Julien Simon perfectly and after his great 2014 season, he would usually have been one of our favourites. However, the Frenchman has been suffering from chickenpox and has been far off the pace in his first races. He is probably not strong enough to go with the attacks but if it comes down to two sprints, he may still have a chance. If Simon is not up for the challenge, Cofidis may look to Christophe Laporte to come away with the goods. The youngster showed great condition in the Etoile de Besseges when he was second behind Tony Gallopin in the uphill sprint on stage four and this makes him a possible contender for stage 1. The climbing in stage 2 may be too tough for him but if he is still there, he will be in with a shot. Finally, Thomas Voeckler, Alexis Vuillermoz and Davide Rebellin should be among the best climbers in this race and they should all be able to do a good uphill sprint in stage 1. However, they need to stay away in stage 2 to win the race overall and as it will be hard for them to drop Gilbert, an overall win may not be within their reach. If they can make a wily move in the finales, however, they could escape and take a solo win that will also be enough to win the race overall. 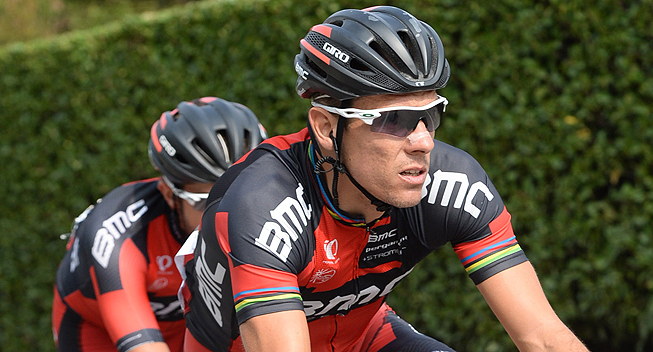 UPDATE: Philippe Gilbert has been suffering from gastroenteritis and had to skip the Trofeo Laigueglia.